« What are some permanent options for Lip Augmentation? 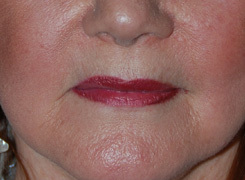 The swelling in the lips usually takes a while to go down after Lip Augmentation (lip filler, lip enhancement, lip plumper, younger lips, lip injectibles) with Facial Fillers. Your lips are very vascular and with that comes easier bruising and swelling. 3-4 days is on the early side. I usually wait for the first 2 weeks for the swelling to go down. During these first 2 weeks is when massage can really help dissipate the swelling. Enzyme injections are also another way of removing restylane, juvederm, perlane but they are more of a permanent removal of the restylane. If enzymes are injected during the first 2 weeks, this may be a mistake. The swelling that would normally go down the first 2 weeks will further go down more if enzymes are injected the first 2 weeks. Sometimes waiting at least 3 weeks is even better. One thing to remember is that restylane and other hyaluronic acid fillers can be shaped though and you shouldn’t have to go through 6-9 months of a less than desirable result. Enzyme’s can help shape your results after 2-3 weeks. 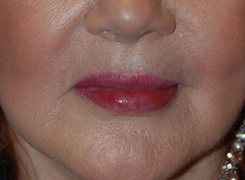 Notice how in the example that the lower lip in the after maintains the size that is 2 times greater than the upper lip. From the viewer standpoint, it doesn’t look wierd to them. This entry was posted on Monday, December 7th, 2009 at 2:19 am	and is filed under Fillers / Facial Fillers, Juvederm, Lip Augmentation / Lip Fillers / Lip Injections / Lip Reduction / Lip Grafts / Lip Advancements / Fat Injections of the Lip, Perlane, Restylane. You can follow any responses to this entry through the RSS 2.0 feed. Both comments and pings are currently closed. Yes you can remove the restylane with many different forms of hyaluronidase. This is really easy so don’t worry too much about it. You can write me back with questions. i had Resylane injected about a year and a half ago and i still have these bumps in my lip and i don’t know if there is a way to get rid of them because they are very obvious and hard. You don’t have to put up with these bumps. There are many ways to improve this. One, is using enzyme injections to degrade the filler. Another option is making a small pin prick and expressing the filler out which is preferred way less than the first option. Don’t worry, your situation can be fixed. You can always inject hyaluronidase to make the restylane dissolve. It depends on how long ago that it was done. If it was within 2 weeks I would wait it out. Don’t worry this doesn’t have to be a long term thing for you. You can get help with this. You can write us on our website on our contact page : http://www.drphilipyoung.com.